How long has it been since you were excited about a car movie? Looking back there were a few good car movies, (Who remembers Dirty Mary and Crazy Larry) especially my all time favorite “American Graffiti”. Has there been or will there ever be a car movie with such massive appeal and with an equally massive following? Released in 1973, American Graffiti still spawns clone cars and I saw “John Milner” (Paul Le Mat) at this year’s Grand National Roadster Show. Wikopedia’s got a ton to say about American Graffiti, but none more amazing then this: Graffiti is the highest cost-to-profit success in film history. When I first saw the trailer for Deuce of Spades, the first thing I thought of was American Graffiti. 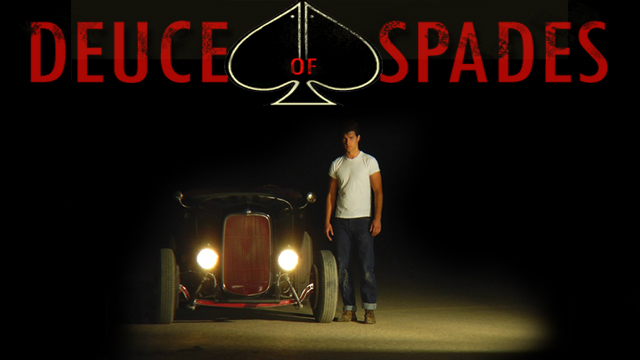 Deuce of Spades is a true car movie and it’s focused purely on hot rods. I can’t wait. I’m not saying they’re similar, because they’re not! Heck, it’s even her car featured as the star of the movie. Faith is, in her words, “a Hot Rod girl extraordinaire, renaissance woman, chick of many hats, master juggler, jack of all trades and master of a couple…” No kidding. Faith believes she should have been born in the US, but some how started life in France. 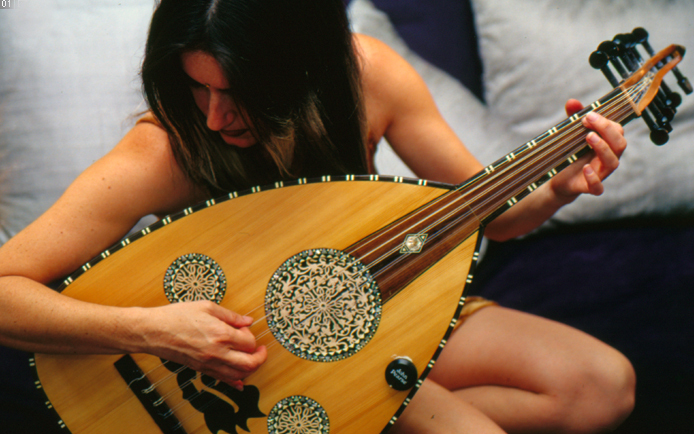 A self taught singer/songwriter and guitar player since age 7, at 10, Faith left France for Beirut. 5 months into her stay in Beirut, a civil war broke out. Yea, really! Persevering and eventually finding success in music, radio and even some modeling and acting, she followed her heart and landed in Los Angeles with a suitcase and $400. Fast forward to January 2007 Grand National Roadster Show in Pomona, CA. Faith, to celebrate her Deuce roadster’s 75th birthday, Faith decided to make a short movie called “Last of the Hiboy Girls” honoring women and their old Ford roadsters. As Faith enjoyed watching the car show audience stop and spend a full hour watching her movie (forgetting about the rest of the show) she knew she had to make her own featured film. Deuce of Spades was born. A film true to the era, true to the cars and true to the spirit of hot rodding. There’s so much more to say about Faith and this movie, but I’ll end it here with this movie trailer for Deuce of Spades. When I first saw it, I immediately contacted Faith to find out who she was and how I can help her with promote the film. Deuce of Spades is almost done now and should be available Spring 2009. With everything she’s done herself, she’s enjoyed, “Full artistic control, pure artistic endeavor” while at the same time, “Glorifying the old jalopies and telling their side of the story for a change.” Sounds great, but that also means she’s footing the bill herself; true, “Indie” film style. If the spirit of the movie moves you, make a donation here. Faith’s having trouble feeding her actors on set, so it’d needed! Make sure you leave a comment about the trailer here to encourage her. I’ll write more to help her tease the movie later. It’s gonna be great! Nice job on that Pike. I think Faith would be happy. She is happy, she proof read it for me! Can’t wait! When’s the release for us to see?? Thanks for the comment! I think we’ll have to wait a while longer on “Deuce of Spades”. I’ll keep my ears open and announce as soon as I know when the movie’s available. Lot of language, too bad that had to be included. I would have to watch with TV Guardian dont mind the craps and dangs once in awhile but the GD’s there is no need for that! Love Hot Rodding and the reason but that talk don’t enhance nothing for me! But I’m just one guy! Hey Mike, Thanks for your comment. I disagree. Every part of this movie is true to the time. If that’s the way people (especially the characters in this movie) spoke back then, which it’s my guess they did, then changing that would not be good for the movie. Looks like release will not take place before the fall of 2009… It remains very hard to predict, because good cinematography cannot be rushed. So let’s all keep our fingers crossed! Last of the Hiboy Girls was a home made documentary, shot from the hip with a $200 camera and done solely for my roadster display at the 75th anniversary of the Deuce Grand National Roadster Show. It was that documentary that inspired me to make a feature film. It is not available for sale. If anyone else has questions fire away, I will be glad to answer them. Hey, that looks pretty good! Can’t wait! Not any good hot rod films out there. Writing from Canada…just stumbled across this site through Google images. Looks great!!! 2 questions – is Jalopy Race part of the Movie Deuce of Spades or is that another movie entirely on its own? 2) Any release date…and any way I can see it up in Canada or how can I purchase a copy? Keep making films!! Great job. The Jalopy race is a small clip of the movie Deuce of Spades. I know that Faith is working hard to finish the movie and I think she’s almost done. The movie will be available all over, don’t worry! I’m sure you’ll get a copy. I just got back from the Daytona Dream Cruise this weekend, where “Deuce of Spades” was test-shown. I wanted to like it. I really did. But I couldn’t. When…IF…the movie is ever released and you see it, you’ll understand why. The writing is amateur, the acting is stilted. The cut we all saw ran over two hours. Every time we thought “OK, it’s finally over!” yet another tedious flashback sequence occurred. Why didn’t we leave? It’s like watching a train wreck, it’s fascinating to watch. Key sequences were filmed at night and so dark you couldn’t make out what was going on onscreen. The lead character (how narcissistic is it of the director to name the lead character after herself?!) had an odd accent that was never explained in this set-in-America movie. I’m sure the curse words used were there to bump up the rating of the film from G or PG to PG13, theoretically attracting more movie-goers. There was the flagrant use of the word “whop” to refer to an Italian character. If they had been black, what do you think the black community would have thought of the repeated use of ‘n*gger’? Hugely offensive to me. And, no, I’m not Italian. Its almost March 2010 why has this movie not been released. This movie must get released. It’s been a long time coming. It looks like a great movie from the trailer and I hope it is out soon. Hello again, here are some updates regarding the film, coming straight from the filmmaker herself. 2- The film was then viewed by professionals in Hollywood, including some Academy members. It has just been offered a $200,000.00 mixing job free of charge by top Hollywood pro sound mixer Patrick Cycconne, who’s clients include Tarentino. This alone speaks highly of the quality of the film. 3- James Nelson, who is the man who mixed the film American Graffiti viewed it last month and he said (I quote): “If the filmmaker does not get an Academy Award nomination for this accomplishment, there is no justice”. As you can see, and despite the opinion of ‘one’ lady who posted a premature critique here (any real movie buff would know better but to post a critique of an unfinished work seen at a test screening) the movie is very strong with massive appeal and promises to do really well. That said, I do not expect that everyone will “get it” and comparing it to American Graffiti is comparing apple and oranges, although both fruits, they really have nothing else in common. And I mean NOTHING. So why even bother? 4- The release date has now been pushed back to June 2010 so to accomodate the sound fixing facility’s schedule and take the film to the pro level. 5- The film length has been edited down to 120 minutes, while the lose cut version test screened was 158 minutes. Despite the length, the audience feedback forms indicated that 90% of viewers felt the film was “a bit long but well worth it” – But I decided to tighten it down to 120 min as I felt the film would ultimately benefit from it. 6- To address the “dark image” as seen by Ann at the screening, the dark image was due to outside projector of inadequate power for the size of the screen used, and has nothing to do with the filming. I was not in charge of the technical aspect of that screening, I merely sent the DVD and feedback forms to Dream Cruise Promoter, who overall did a great job at organizing the event. To address the comment of being “narcistic” for playing the “hotrod” gilr in the film here are a few things to think about: 1- the Hot Rod girl character is based on me and my car as I truly am in real life. So basically I am doing a cameo and playing me. It would have been strange to hire someone else to play me, especially since that actor would have had to drive the deuce in traffic, drive into a small twister (not even kidding) and the safety and liability concerns alone made it easy to decide that the filmmaker should be cast as her ownself. Just as Bill HInes and Gene Winfield were played by the real Bill and real Gene. I hope this sheds some lights as to the motivations behind the decisions. There are many producers/ director who also are actors in their own films. Sometimes it simply works better in the end to do it that way. Well, I’d better go back to preparing my audio files for Patrick if I want this film to be done by June. I can’t wait to share it with all of you, it is truly a very powerful drama and a very accurate period piece, one that might bring the jalopies back to silver screens… So keep your fingers crossed! You can support this worthy endeavor by pre-ordering a copy of the film – Just visit the online store at http://www.deuceofspadesmovie.com . Advance DVDs will be autographed by me and the stars of the film and hand numbered. All funds raised go to help with the last post production expenses and pressing the DVD’s first batch. Many thanks for your wonderful support and keep spreading the word about Deuce of Spades. I forgot to address the “language” comments posted here by a couple readers. My initial script did not have any swears in it, as my erroneous idea of the fifties was that no one ever said a foul word – as seen in old TV series and old films. My historical consultants pointed out to me that Foul language was “censored” back then so the writers were not able to use it freely. However, they pointed out to me that the hotrodders did swear in real life and quite often so, although never in the presence of the ladies. In one of the scenes, we see a pissed off Johnny use some swears while in the presence of Bettie. He then immediately apologizes. In other scenes, ones that only involved the boys, the swearing is inhibited. My dialogue consultants included 5 males old timers, and one female, all of which lived the 50’s hotrod era extensively. They looked at the scenes, and situations, and suggested the language, and I specifically asked them to make it sound TRUE TO LIFE – exactly what hotrodders would have said back then in a similiar situation. Such dialogue consultants include Tom Sparks – a most respected hotrodder from the fifties, featured in many books, Jim Miller, curator for the American hotrod Foundation, to name but a few. In my case, being true to the era and hotrodders of that era was far more important to me than ratings and sales and profits. Dialogues are not only true to the era and to the situations, but consistent with the characters. Some swears and others don’t. Some swear a lot (Tommy has a foul mouth – because he is a in-your-face lower class kind of character) but Johnny actually swears rarely. I hope this sheds some light as to the motivations behind the choice of Slang, swears and dialogues in the film. It about time a movie like this is coming out. I saw the making of “American Graffiti” In Petaluma,ca. I would like to purchase this movie! How can I get it?